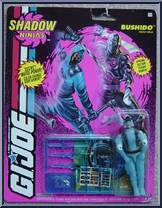 BUSHIDO is known for being cool and calculating in the heat of battle. 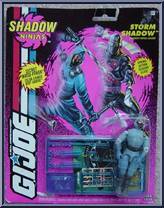 After studying the techniques of such notable ninjas as STORM SHADOW and SNAKE-EYES, he trained himself in, of all places, Icelan. . . 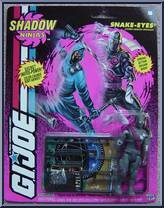 When the Joes say they can't hit what they can't see, they're talking about the stealthy Night Creepers. 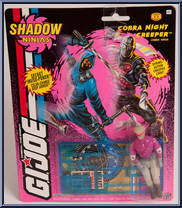 Captured Cobra documents first revealed the existence of these vicious ninjas, who conduct all . . .
Nunchuk studied mystic fighting forms at a school run by a mysterious blind master in Denver. Driven by the need to perfect his form, Nunchuk moved to San Francisco where his distinctive style caught . 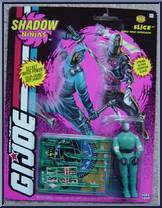 . .
SLICE is rumored to be a renegade ninja from STORM SHADOW'S clan. It is believed that Slice created his own evil sword technique by observing the battle strategies of scorpions. He even adapted one of. 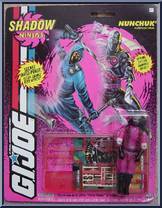 . .
SNAKE-EYES excelled in Long Range Recon Patrols and high-risk covert missions in Southeast Asia. His success was based on his ability to use everything from trees to fog when making himself virtually . . .
STORM SHADOW's fighting skills are known throughout the world's martial arts community, from San Francisco's Chinatown to the most remote Tiberian village. But don't expect to see him hanging around m. . .